These days, the majority of what we all see in the off-road press world are reviews and news pieces on the latest UTVs on the market. Luckily, today is not one of those days, my friends. 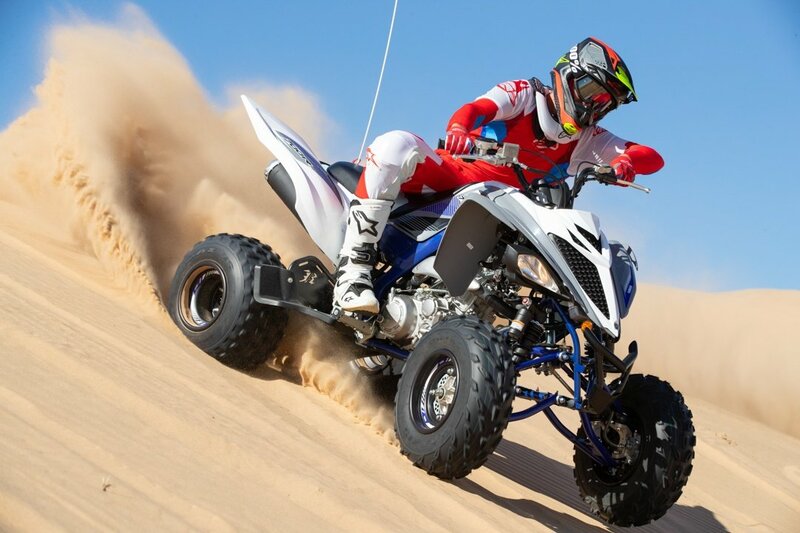 Yamaha recently invited us to take a trip out to the notorious sand dunes of Glamis where I rode the latest Special Edition QUADS from the tuning fork brand. Grab a thumb full of throttle with me and let’s sling some sand! The low-slung, go-fast machine of this duo has to be the YFZ450R SE, affectionally known as simply the YFZ to many. At 48.8” wide and boasting a healthy 11” of travel in the back and 9.8” of travel in the front, this quad is built to attack corners and power through the gnarliest of whoop sections. The motor on this quad is, ahem, phenomenal for a race-ready machine. For those of us who like to rev out an engine to really feel all the potential ponies, the 449ccs build power like the best 450-class engines out there in the dirt bike world. The bottom end is present but isn’t very impressive in stock form, especially after you get off the luggable and torque-rich engine in the Raptor. I can tell you from experience that the YFZ can be made to have a bottom end with a couple simple modifications – our family owns a modified YFZ450 that has a pipe and filter on it, along with a re-jet because it’s an older carbureted model, and the bottom end is ever more present with those simple uncorking modifications. However, in stock form, the YFZ starts really building power in the mid-range and just absolutely starts pouring on the go-fast feelings from the mid-range all the way to the limiter on top. No sign off here, it builds all the way up! When you pair this engine to the 5-speed manually shifted transmission, the power is put to the ground in such a direct way that you can make minute throttle inputs and really feel this quad react in fractions of a second to the inputs you are making. The ability to have this great of an engine feel puts a huge smile on your face. And, the smiles are continued with a fairly easy clutch effort from the assist-and-slipper unit. I could momentarily ride the clutch in corners for more precision when needed, but I found myself more often than not just riding the power band out because of the smooth power delivery. Credit the smooth Yamaha fuel injection system for this as well. Yes, the engine is great, but the chassis setup and race-inspired ergonomics could be the best parts of this entire quad. Yamaha has always been known to have a point-and-shoot handling style, especially when you’re attacking corners on a motocross track or out in the dunes, and the latest YFZ does not disappoint in this department. Just like the engine, the steering can take minute adjustments and you feel exactly what the quad is going to do with the smallest inputs on the bars. In other words, the steering is quick and precise with minimal bump. In an effort to dial in the riding ergos, the bars have several adjustable positions that allow riders of different sizes to dial in their fitment settings. The seat is also designed for easy mobility with a compact front section that flows right into the tank plastics and a wide, T-shaped rear that allows you to pivot your weight balance across the seat when attacking corners or switching balance when in the air. Overall, the quad is highly flickable in the air, too, making it very confidence inspiring when you want to create your own airplane runways and takeoff/landings. If you want a Cadillac ride in the dunes, the Raptor will be your go-to choice between the two of these quads. While the YFZ does have fully adjustable front and rear shocks with oh so much travel, the springs and entire shock setup is designed to be more sporty, offering up a system designed to attack long whoops sections, fly over the big air jumps, and speed across any gnarly rutted sections that you might come across. Cadillac ride, not so much. Instead, think Porsche. 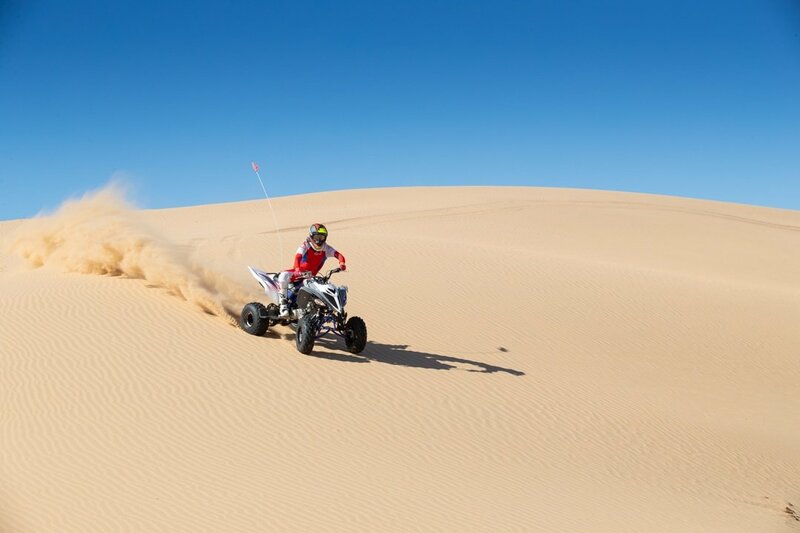 We discovered a worm track in one of the secluded areas in Glamis and found ourselves romping through hairpin corners, long 4th gear wide open whoop sections, and long sweepers that tested my steadfast cornering ability. As I conjured up more and more confidence in this quad with more laps on the track, I was really able to hone in on the suspension ability of the YFZ and it’s steadfast nature to not do anything unexpected, like buck the back end or oversteer in the tight corners. In stock form, the rear shock and swingers setup perform admirably with no unexpected bucking of the solid axle rear end. Both front and rear shocks offer superb bottom resistance as well – I appreciated this when finding steep G-outs at the bottom of bowls where the front tracked straight and true through the most brutal part and the suspension soaked up the bumps with ease. Again, this chassis shines in these tight sections with point-it-and-go steering every corner, every time. I could say the same about the wide open straights where the quad tracks straight and is extremely predictable. What’s not to like about the YFZ450R SE? As you can tell, not much is here not to like (my only slight complaint about the lack of bottom end is easily fixed with a pipe setup to “wake it up”). 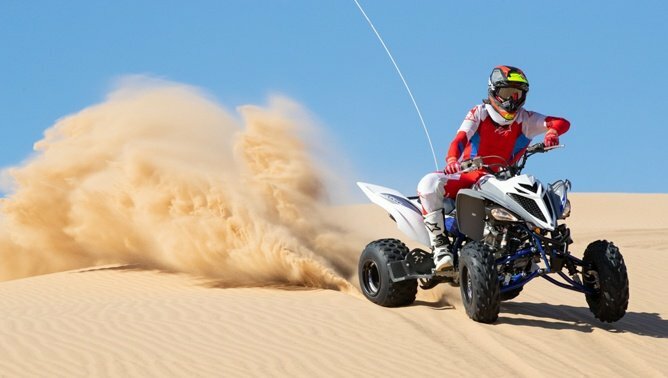 It is the only sport 450-class quad on the market these days, and Yamaha already had one of the best on the market when every other manufacturer decided to drop theirs several years ago. 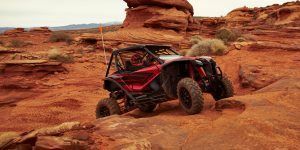 Through the transition to more and more people choosing UTVs, Yamaha has stuck with their quad lineup and has been rewarded in the last several years with increases in sales and a promising outlook on quads for the future. I know I’ll continue to ride them for many, many years, especially if we still have quads like the YFZ and Raptor around. So, what about the Raptor 700R SE?! If the YFZ gives you the feeling that you’re always around your crazy cousin who does hair brain stunts at family gatherings, the Raptor 700R SE is your calm uncle who seemingly comes to family BBQs with a mild-mannered persona but unleashes some ridiculous BBQing technique on you and nails a ridiculous set of ribs – this quad has that calm but comes-out-of-nowhere power that you just love to be around and gobble up! With a slightly higher seat height and a definitive upright riding position compared to the YFZ, the Raptor is dubbed as the “dune king” around the community because riders can literally lug this machine around the dunes and get anywhere and everywhere they want to go, in all day comfort. Sitting on the Raptor instantly makes you feel at home – it’s just “comfy” in all ergonomic aspects. I couldn’t help but feel at home on this quad, and it continues to feel at home right from when you push the electric starter to fire up the YFI-controlled engine. Of the two quads here, the Raptor has the burly exhaust note down with a definitive lope-style characteristic. No wonder so many Raptor owners put aftermarket exhausts on their quads and call it good – the sound is fantastic. 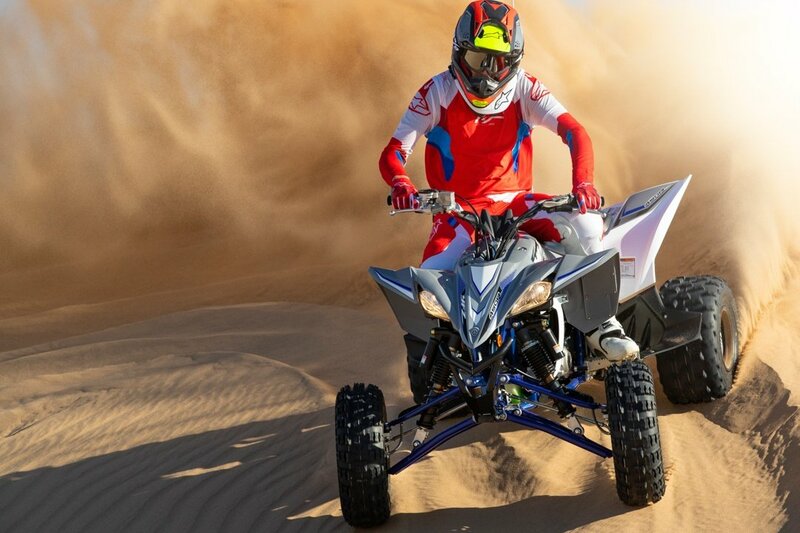 Mated to a 5-speed manual transmission, this 686cc machine is a heck of a dune runner. As I mentioned, the ergonomics are spot on for riders who like a more comfortable, upright stance. The Raptor is a great choice for those of us who like all-day rides and like to come back feeling ready to go again the following day. The seat has more padding to it (great with the squish test! ), and the handlebars and levers are all placed in easy to reach and good locations. Yes, I might have overstated that this quad gives you a laid back feeling when riding it, but I’d be wrong to say that you can’t hustle this chassis around corners. Make no mistake, it’s not the YFZ in terms of flick-ability or low-slung handling characteristics, but that doesn’t mean you can’t fling it into corners and ride it through a whooped out section. The fully adjustable suspension on the SE model couples well with the hybrid aluminum/steel chassis to allow the rider to push this quad through the turns with confidence. The precision of the steering on this quad is similar to that of the YFZ – point and shoot. The Raptor does what you want it to do and goes where you want it to go, simple as that. 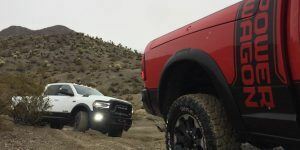 If you want to attack long whoop sections, the a-arm front suspension with 9.1” of travel and solid axle rear suspension with 10.1” of travel allow you to do that with confidence. Alright, alright, so the Raptor handles well and is comfortable on all day rides, but I can get that in a UTV all day long. So, why buy a Raptor?! The answer is simple: the power! 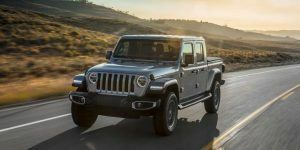 This engine is at home in the dunes or on the trails because it has a MASSIVE amount of low-end torque, and that power steadily builds all the way from the low RPMs to the very top. I found myself leaving this quad in a gear too high all the time in Glamis just to see if I could lug it up a steeper hill, and the Raptor rewarded me every time with unrelenting power. Man, I could get used to that kind of power… Just imagine if we had paddles and an exhaust on this quad! I would have been like the Superman of the dunes with all that power and capability. 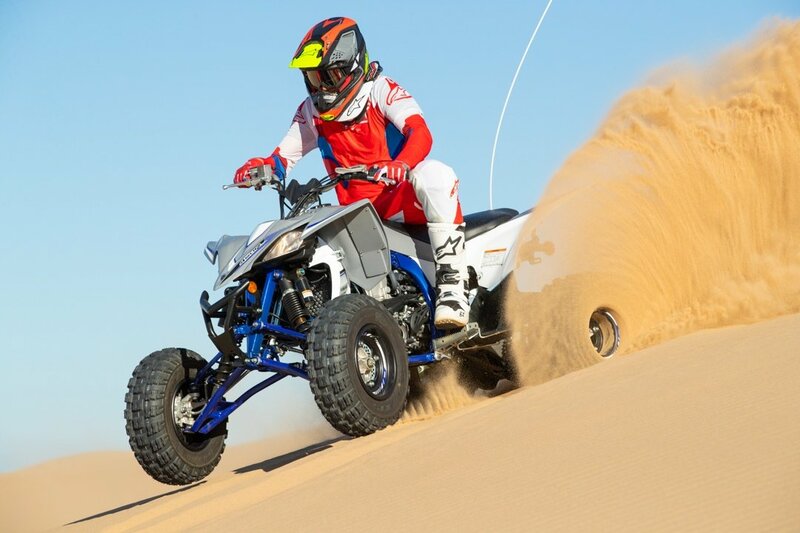 As I said at the top of this Raptor review, this 700-class sport quad is regarded as the best dune quad out there for several simple reasons – engine power, all-day comfort, and point-and-shoot handling. If you don’t like the more upright stance, then you’ll probably opt for the YFZ with it’s more racey ergos and handling characteristics. Otherwise, the Raptor is a phenomenal all-around choice for a quad and will continue to be a great choice from Yamaha. If I had to pick either the YFZ or the Raptor for the dunes, I would probably have to pick the Raptor as my long term choice, purely for the fact that this quad is more comfortable for all day rides. Also, it truly has an amazingly capable powertrain setup. 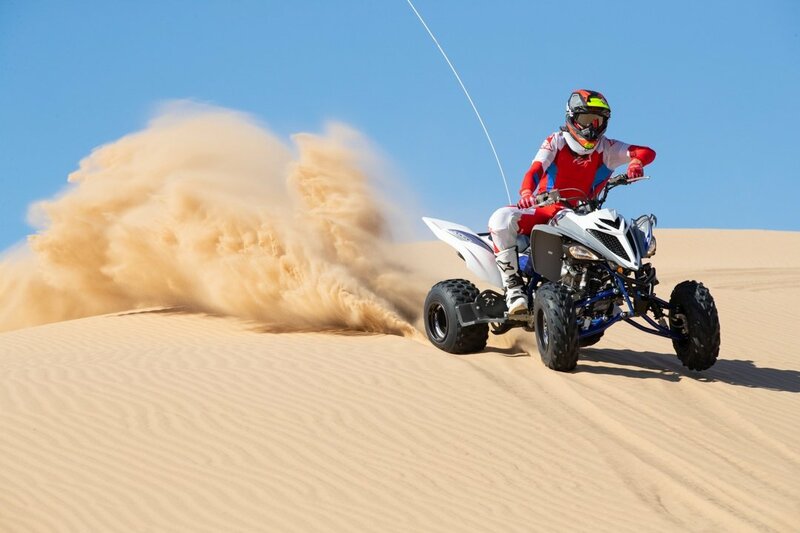 The fact that the shocks are all fully adjustable is a bonus as well – I found myself enjoying a smoother ride on the Raptor than the YFZ and I could still attack the big dunes and G-outs with speed. As you can probably tell, the pictures tell the story of how much fun you can have fully geared up riding a couple of amazing sport quads. There is no other feeling like it in the world when you’re on a YFZ or a Raptor, have an open set of dunes in front of you, and you have the ability to carve them all day long. 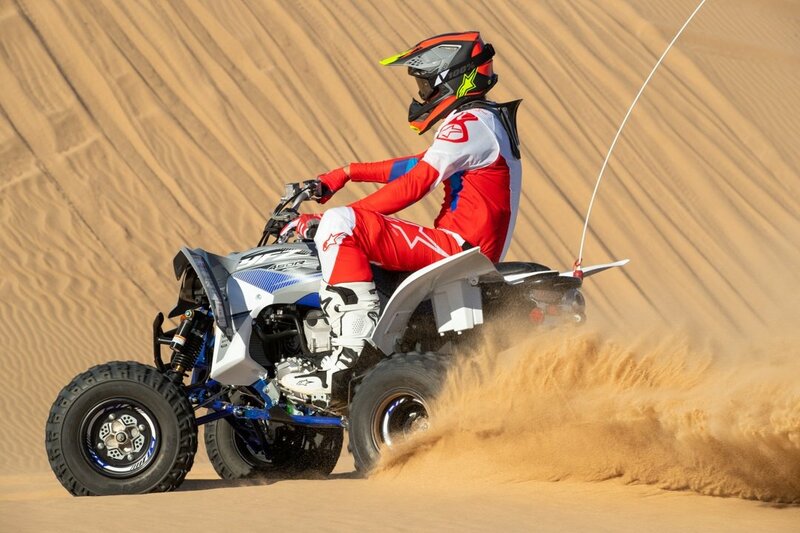 If you haven’t yet, I hope you all have the opportunity to experience riding in the sand one day, and I’ll be right there with you, hopefully on one of these Yamaha SE quads. Let’s ride!